Two Reed runners accomplished an incredible feat of endurance last weekend, running 50 miles in the American River Ultramarathon. History major John Young ’15 crossed the finish line in 8:54:52, coming in 114th in a field of 823. John, who hails from The Dalles, Oregon, was the youngest runner to complete the race. John ran hot on the heels of Reed bookstore manager Ueli Stadler, who posted a time of 8:48:51, coming in 102nd in the field. 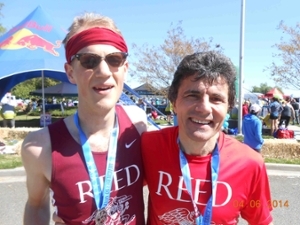 John and Ueli are both regular members of the Reed Runners, a ragtag group of students, faculty, staff, and alumni, who can be seen plying trails and paths throughout southeast Portland. The last couple of years have witnessed a surge of interest in running at Reed. Record numbers of Reedies have turned out for the Hood-To-Coast Relay and the Portland Marathon. Reed holds a 5K Odyssey Run in September and there are unconfirmed rumors about a moonlight running group. As far as we're concerned, the idea of running 50 miles (roughly the distance from the Reed canyon to the Reed ski cabin) provokes one overriding emotion.